Perched on the north edge of Washington Park in Albany, 10 Thurlow Terrace is one of the city's unique properties. The home looks like a castle on the outside, and the interior is filled with beautiful woodwork (there are photos at that link). And now it's close to finding a new life. The owner of 10 Thurlow and the Castle Island Bilingual Montessori school are working on a deal in which the school would move into the historic home. "We're really excited. 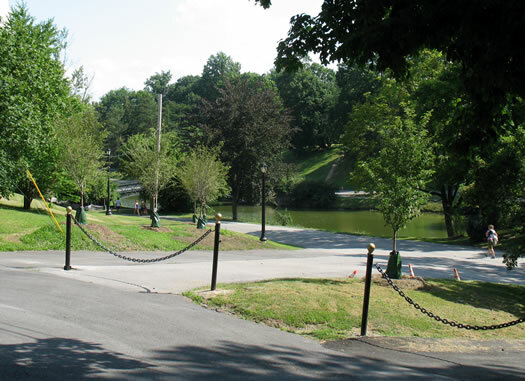 It's an exquisite location," Diane Nickerson, the director of Castle Island, told us today of the plan. "If you want to give the best to your kids, why not give them the best facility for the school? They deserve that." Castle Island is a new school that combines the Montessori approach with English/Spanish bilingual education. It started with six students last fall, finished this past school year with 13, and it looks like they'll have around 50 students for the new school year. It's currently located in the Boys and Girls Club building on Delaware Ave.
Nickerson explained that growing the school is a chicken-and-egg problem: To have more students, the school needs a bigger space. To be able to afford a bigger space, the school needs more students. So the move to 10 Thurlow is a big jump. Nickerson said Castle Island is working with the home's current owner on an arrangement to buy the building (its list price is $1.15 million, though details of this specific deal weren't available). To make that happen, Nickerson said the school is doing some "urgent fundraising." There's an upcoming tour for families who are currently enrolled or are thinking about enrolling. There will be a larger, more formal fundraising event August 22. And there may be other events. "My seller is doing his best to work with them," Sam Critton, who's representing the current owner -- Larry Jones -- for TL Metzger, told us today of Jones' willingness to allow Castle Island to open the building to visitors ahead of the situation being a done deal. "We feel that's in everyone's best interest." The 8,600-square-foot home at 10 Thurlow Terrace was built in 1891 for Charles La Dow, an inventor of agricultural machinery. It was designed by Ernest Hoffman, who also designed the nearby firehouse at Western and Washington. The building has been for sale off and on since 2009. Critton said it's been under contract twice in that time, but the sale fell through both times. Washington Park view from the curb in front of 10 Thurlow. "It's a challenging property, there's just a very narrow market of buyers," Critton said. 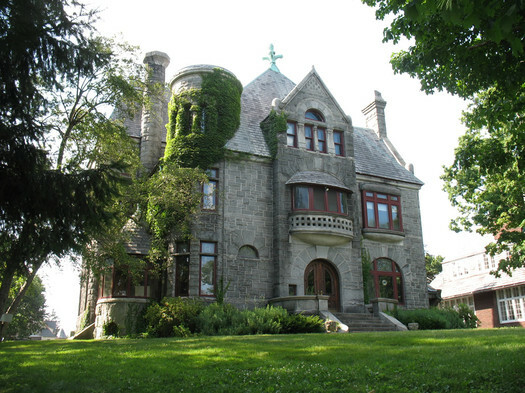 "As you can imagine, there aren't a lot of 10,000-square-foot castles for sale in Albany." Another challenge: finding someone who will take care of the property and maintain it in the style of its original design. "Larry does have a little bit of a sentimental attachment to the building, it's a unique building, and it has lots of stories. And he can appreciate that history, and he wants to make sure the next steward can have that feeling." Nickerson emphasized today that maintaining the home will be a core part of the school's mission there. "Montessori learning environments should have a high aesthetic quality to them," she told us. "We plan to take very good care of it." Cool! I used to work for Larry Jones, and I used 10 Thurlow to record podcasts because it had good acoustics in the top floor. There was a little paper sign in a plastic sheath on the first floor stating that puffed rice was invented in the basement of that building by firing wet rice out of a cannon. And it might just be true, since some old timers tell me they remember the "fired by cannon" slogan on a particular brand of puffed rice. It's going to be tough to keep the house as-is and convert it to a school. It'll need exit signs, a sprinkler system and handicap accessibility throughout. Anyone else a little concerned by if this building does got the rout of being a school it will be removed from the tax roles? I'd much prefer it be reused as a bed & breakfast. I had a landlord that was an attorney in the building next door and his office faced 10 Thurlow Terrace. He claimed that the place was haunted. Duncan -- I'll be joining the Bad Boys, etc. Tour in August and realize that this property won't be a part of it. Any way you could elaborate here? Everyone loves a good ghost story. Thanks! oh man. Don't destroy this beautiful building by turning it into a school. I second the bed and breakfast idea above. @Jason, the photos on the realtor's listing site certainly feel haunted. Or maybe that's just from the creepy background music that plays during the slideshow. Absolutely believe this is a fantastic use of the property! 30k +- in annual tax revenue just thrown away. they should still play the normal share of taxes for this building. Surrounding owners should not have to pick up the slack for this school. their zoning variance should be granted contingent upon the school paying their fair share of taxes for this building. Wow, I can't believe that people are trying to deny a bunch of kids their chance to go to an awesome bilingual version of Hogwarts. Do you really think an expensive B&B will be profitable? In all the years I've lived here, pretty much every business that is founded on the expectation that rich people will come to Albany has failed miserably. If it was turned into a B&B, some starry eyed couple would end up sinking their life savings into that building, the business would go under in a year or two, then sit empty, not paying taxes for years and a bunch of people on AOA will heatedly debate what best to do with it to preserve its historical integrity. Be happy for the kids and teachers who can have a really cool school. If you want to complain about the tax rolls, talk to the College of St. Rose. I hope that Larry wishes are kept and that my great grandfather's home will go into some loving caring hands. I was able to go on a tour with one of the partners of the law firm while visiting Albany many years ago and really like how they had restored the home. My grandfather was an amazing person with over 100 patents. Many of which were farm implements, however, the list included: erasers for mechanical pencils, shot gun shells, the pneumatic cylinder to close doors slowly. I don't believe that he ever received a patent for the puffed rice, since he died of a heart attack before my great grandmother was able to take that invention to McCormick. The other part of the story that is interesting is that his son also Charles W. LaDoW married a Weed, from the same family Thurlow Terrace is named after ( Thurlow Weed). Many don't remember what a major role Thurlow Weed played in our country during the 1800s. He was the best friend to William Seward (Secretary of State) under both Abraham Lincoln and Andrew Johnson. Not only was Thurlow a key advisor to Seward he was an advisor to Lincoln and played a huge role in getting enough votes to prevent the impeachment of Andrew Johnson. By the way, the ghost story may come from the fact my grandfathers brother, died in the house one night when the flame for his reading lamp went out and he succumbed to the gas fumes. Although I never knew anyone in our family to have said they had any experiences with ghosts. Does anyone know if Larry still owns the property or if the school ended up purchasing it and converting it? We have owned restaurants in Atlanta Ga for 24 years but I have been watching this amazing beast for the past 2 years with dreams and aspirations to someday sell everything we own, give everything I raise to Larry and drive up to the front steps of our new and forever home. Even if that means residing in the carriage house and feeding all of you with culinary and historical sustenance. Sorry, that's just me being silly not smug. We just want to feed you mind and body by turning it into a museum, gallery, classical music venue, bed and breakfast in a botanical garden setting without changing a thing about the perfect and majestic interior beyond creating a communal commercial kitchen. I think I forgot to mention (as I got trigger happy and sent too soon) that I am a chef who is always on the line when it is busy but always makes time to treat my guests like family. My wife is a baker and a musician and our goal is to create a life that would allow us to adopt a family of 5-10 so the prospect of this being our family home (if it were allowed residential zoning) is equally awe inspiring as I picture the future. And In that case I would just open a cafe in town, sling hash and enjoy the culture, arts, music, nature, food and waterways Albany had to offer. Either way, 10 Thurlow Terrace is the embodiment of everything I have ever wanted for the last half of my life and the beggingings of my children's lives. @Cal --It seems as if Larry still owns the property and it's currently for sale for $799K. 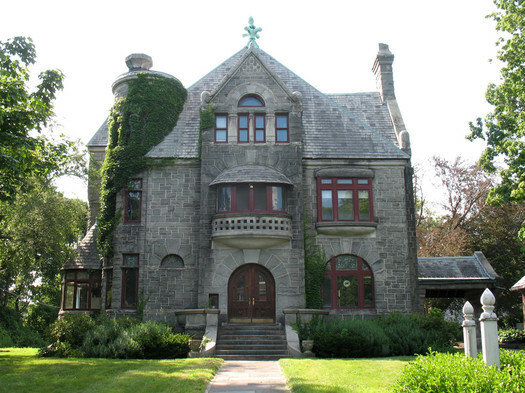 The school (Castle Island) didn't move into this gorgeous house, but moved up to North Main Avenue. So the castle is still on the market! Also, the Albany Institute has a wonderful image of The Castle when it was quite new available for viewing on-line now. It's dated 1899 and shows how stunning it was with the original turret intact.